This special flexibility formula combines the three leading nutrients for building cartilage, ligaments, and tendons. This synergistic complex provides the precursors for the production of bone, cartilage, tendon, joint tissue, skin, blood vessel walls and mucus membranes. This powerful combination of Glucosamine, Chondroitin and MSM forms a powerhouse for joint health. Glucosamine is involved in the formation of the nails, tendons, skin, eyes, bones, ligaments, and heart valves. 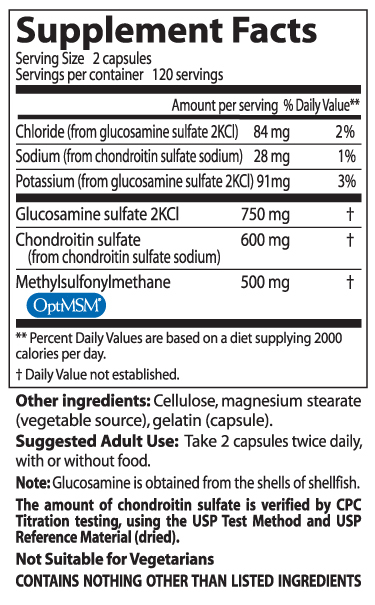 Glucosamine can be helpful for osteoporosis and tendinitis. Chondroitin is the cartilage builder. Chondroitin helps attract fluid into the proteoglycan molecules, which acts both as a spongy shock absorber for the bones, and also as a mechanism to sweep body nutrients into the cartilage. Methyl Sulfonyl Methane (MSM) is an excellent source of usable organic sulfur. One of the most significant uses of MSM is its demonstrated ability to help relieve pain and inflammation. Arthritis patients report substantial, long-lasting benefits with MSM supplementation. Glucosamine is involved in the formation of the nails, tendons, skin, eyes, bones, ligaments, and heart valves. It's a major building block of healthy cartilage and helps keep joints, ligaments, and other connective tissue strong and flexible for free, easy movement. Glucosamine can also be helpful for osteoporosis and tendonitis.Glucosamine Sulfate is a component of joints and intestinal tissue and is involved in the production of synovial fluid which lubricates the joints. Chondroitin sulfate is a sulfated mucopolysaccharide found in cartilage, tendons and ligaments, where it is bound to proteins such as collagen and elastin. In our joints, it contributes to strength, flexibility and shock absorption and provides the necessary building blocks for connective tissue repair. It is a major constituent of cartilage - the tough, elastic connective tissue found in the joints.